The Integrated Notification System (INS) allows you to send a short message (SMS = Short Message Service) to a mobile phone using your computer. It supports Picture messages, Caller Group Graphic, Operator Logo, Ringtones and Flash SMS. The messages can be sent through an attached modem, through an Internet connection or directly through an attached mobile phone. If a mobile phone is attached to the computer (IE through the IR port), the contents of the inbox can be downloaded and stored in folders. The phonebook can also be downloaded and synchronized with INS. Sending Picture messages, Caller Group Graphics, Operator Logos and Ringtones only work for Nokia phones. Most new phones can however now receive FlashSMS. Downloading and synchronizing the address book is possible on most mobile phones that can connect to a computer (either through the IR port or a cable link). How can SMS be sent? INS supports a wide range of protocols (XIO/TAP, UCP, INET, PDU) hence can be used for most of the SMS services. INS accesses through your modem, the Internet or the mobile phone a SMSC (Short Message Service Center) and submits the message you wish to send. Then the SMSC transmits this message to the desired mobile phone. 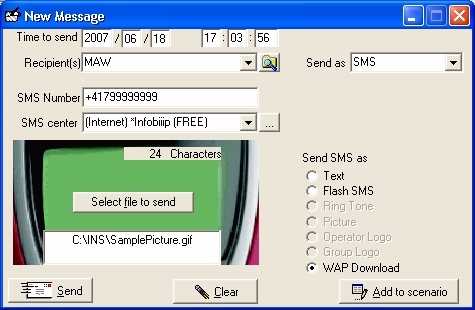 When you send the message through your mobile phone (attached to the computer), INS will use the parameters (Sender ID, SMS center, etc) of your phone to send the message. Sending will work the same as when sending messages from your phone, except that you type the message on your computer. Not all phone manufactures implement however a link to the computer (IR port or serial cable link). You can send text, pictures and ringtones. Having the mobile phone connected to the computer has the additional advantage that you can transfer data from your phone to the computer and back. IE you can synchronize your phone book and archive received SMS on your computer. There are two different protocols supported by the SMSC, either XIO/TAP or UCP. XIO/TAP is an older protocol initially designed for pager messages. SMSCs that support this protocol will not be able to process pictures or ringtones. They can only process text messages and can not send the SenderID. SMSCs that support the UCP protocol can send text, pictures and ringtones and support sending of the SenderID. There are several web sites that allow you to send SMS through their web interface. Those free sites only offer you to send text messages and require you to send the SMS through their web site, so that you are exposed to their ads. Often they add also a little commercial statement at the end of your message. INS can not send SMS through those web sites. INS can however send messages through a number of commercial gateways (IE www.clickatell.com). Those sites allow you to set up an account and buy blocks of SMS. You can then send the messages either through their web site or through our INS. For more details on how to open an account please go to http://www.mawnet.com/inetsmsc.html. Once you have received your userID and password go to SMS services and enter those details in the corresponding fields. The cost per SMS for all three options is more or less the same. With the mobile phone link and the modem link you pay on a per usage, while with the Internet gateway you prepay blocks of messages. INS will work with all mobile phones that come with a modem driver. Flash SMS is just like normal SMS. The difference lies in the way it appears on the receiver handset. The receiver of Flash SMS would see the message without the need to press any button on the handset. It would appear on screen upon arrival. The downside is that this message will be overwritten by the next flash SMS, if it is not saved. Almost all of the newer phones support Flash SMS. Ringtones are supported in the RTTTL format. RTTTL (Ringing Tones text transfer language) is a language used for publishing ringing tones on web pages. You will find hundreds of web pages with ringtones in RTTTL format. If you do a +ringtone +nokia search in for example Alta Vista, you will find hundreds of links to pages with ringtones in RTTTL format. Note: The limitation to 160 characters does not apply to ringtones. Depending on the SMSC it may however reject large messages, IE over 300 characters. The pictures must be in 2 colors only (black and white) and in the format: 72x28 pixels. You will find a lot of ready-made pictures on the net if you do a search. But you can also make them yourself with a paint program like Paint Shop Pro or Windows Paint. Note: Because of the size of pictures INS will need to dial three times to get the picture across to the SMSC. The pictures must be in 2 colors only (black and white) and in the format: 72x14 pixels. Choose YOUR Operator/Network from the Operator list. …How can I get my original Logo back? Send a logo, it doesn't matter which, and choose "Clear logo" from the Operator list. When you save that logo, it will not show up, instead you get your original logo back. Check the WAP Download option and enter the local path of the desired content. The file will then be uploaded to our web site and you will receive a SMS indicating you from where you can download the file to your handset. Your handset must support the WML (WAP Markup Language) standard to read the cover file. You must also make sure, that your handset is able to play/display the file format you send to it. Normally handsets can only display correclty JPG or GIF files and play RM or MID sound files. Please note that the file will be automatically deleted again from our web site after 24 hours, hence you must download it before that. Your modem needs to support a connection to a PC (IE through IR). If you have troubles with the IR port or need to know which virtual COM port is assigned to the IR port please check in the windows control panel the IR settings for your computer. Make sure that the IR-Transmission is activated. To install the MS patch just restart your computer with the mobile phone in front of the IR port. Win2000 will detect the new device and install a new modem driver for it.